"It is a book written by one loafer for a brother loafer to read." A Tramp Abroad was first published by American Publishing Company in March 1880. It was a travelogue based on the time Clemens spent in Europe between April 1878 and August 1879. The first edition is a massive subscription book of 157,000 words in 50 chapters and 6 appendixes. It features 328 illustrations by artists Walter Francis Brown, True W. Williams, Benjamin Henry Day, William Wallace Denslow and adaptations of previously published illustrations by James Carter Beard, Roswell Morse Shurtleff and Edward Whymper. Many of the illustrations were imbedded on the page with text flowing around them. In addition, Clemens himself contributed at least 10 or more pictures to the 1880 edition. In order to maintain uniformity in size with other volumes in the 1899 uniform edition sets, Frank Bliss divided A Tramp Abroad into two separate books which became not only Volumes 3 and 4, but also parts 1 and 2 of the title work itself. Almost all of the original illustrations were eliminated and new printing plates produced. Running page headings that were present throughout the first edition were eliminated. Volume 3 of the uniform edition ends with Chapter 29. Volume 4 begins with new chapter numbering and what was once Chapter 30 from the first edition is Chapter 1 of Volume 4. While the new uniform edition of A Tramp Abroad offered Clemens an opportunity to revise and refine his work, no detailed comparison of the text to the 1880 first edition has been conducted. However, when passages in the original text referred to illustrations that had been eliminated from the uniform edition, these passages were deleted. For example, Chapter 12 of the first edition describes children playing barefooted in the street. Illustrator Walter Francis Brown drew children wearing shoes for an illustration titled "Generations of Bare Feet." Clemens chided the illustrator in a footnote at the bottom of the page "I certainly thought them barefooted, but evidently the artist has had doubts" (Twain, 1880, p. 113). Two surprising revisions are found in the visual presentations of A Tramp Abroad in the uniform editions -- the relocation of the illustration titled "Titian's Moses" and the selection of one new and uncredited illustration titled "Lorelei" (both discussed below). It is unlikely that any of the revisions were made by Clemens and are more likely the work of Frank Bliss. No examination of Morgan's notes for A Tramp Abroad has been conducted. 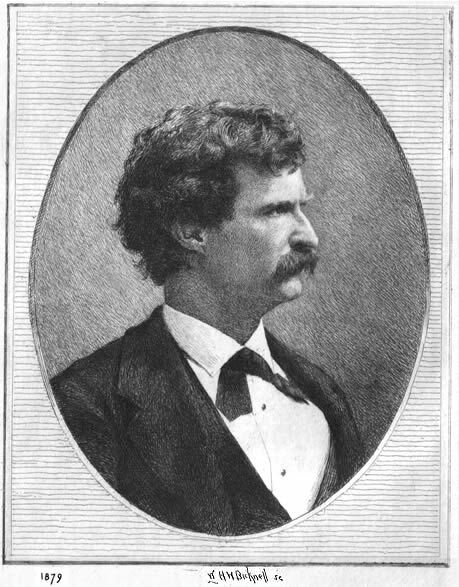 Frontispiece of Volume 3 etched by William Harry Warren Bicknell based on a photograph of Mark Twain from 1879. Frank Bliss hired artist Thure de Thulstrup (b. 1848 - d. 1930) to furnish six full-page illustrations for Volumes 3 and 4 of the uniform edition of A Tramp Abroad.. De Thulstrup was born in Sweden on April 5, 1848, the son of Magnus de Thulstrup who was a former Swedish Minister to France. Thure de Thulstrup was educated at the National Military Academy in Stockholm. He was commissioned in the French Army after graduation and served in Algiers. After his military commission expired, he studied art in Paris. From France, he traveled to Canada and worked as a topographical engineer and then went to New York where he obtained work as an artist on the New York Daily Graphic. He eventually ended up at Harper's Weekly working alongside Thomas Nast and held a position of staff artist there for twenty years documenting such events as the funeral of President Ulysses S. Grant and Queen Victoria's Diamond Jubilee for American readers. Some correspondence between Thulstrup and Frank Bliss survives in the in the special collections at the University of Virginia. A letter from Thulstrup to Bliss dated April 17, 1899 indicates he was still waiting to be paid for his artwork. Thure de Thulstrup's "The Deluge of Blows Began" appears in A Tramp Abroad, Volume 3 as a black and white illustration. It was hand-colored and used as the frontispiece of Volume 3 of the Riverdale Edition issued in 1901. Thulstrup's illustrations for the 1899 uniform edition of A Tramp Abroad lack the sense of humor and playfulness that Walter Francis Brown, True Williams and other illustrators brought to the first edition. The 1880 first edition of A Tramp Abroad featured two frontispieces. The first was a portrait of Mark Twain by engraver J. A. J. Wilcox of Boston based on the same photograph Bicknell engraved for Volume 3 of the 1899 uniform edition. The second frontispiece of the 1880 edition was an illustration titled "Titian's Moses" engraved by Adolphe Francois Pannemaker (b. 1822 - d. 1900) and based on the famous painting by Paul Delaroche (b. 1797 - d. 1856) titled "Miriam and Moses." "Miriam and Moses" by Paul Delaroche from Harriet Beecher Stowe's Woman in Sacred History published in 1873. On 10 June 1879 Clemens wrote Frank Bliss from Paris and described his handiwork "Titian's Moses"
It is a thing which I manufactured by pasting a popular comic picture into the middle of a celebrated Biblical one -- shall attribute it to Titian. It needs to be engraved by a master (Hill, pp. 116-117). Titian's Venus defiles and disgraces the Tribune, there is no softening that fact, but his "Moses" glorifies it. The simple truthfulness of this noble work wins the heart and the applause of every visitor, be he learned or ignorant. ... I got a capable artist to copy the picture; Pannemaker, the engraver of Dore's books, engraved it for me, and I have the pleasure of laying it before the reader in this volume (Twain, 1880, p. 579). The final line in the final chapter of the first edition of A Tramp Abroad refers the reader to the frontispiece. 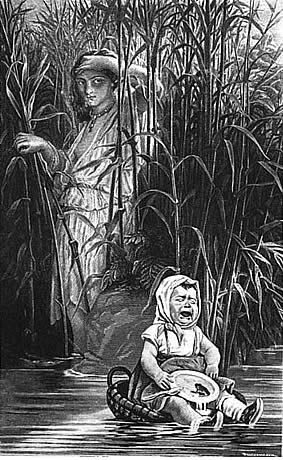 In the 1899 uniform edition, Frank Bliss placed "Titian's Moses" in the final chapter of Volume 4 adjacent to the passage where Mark Twain spins his hoax. Bliss removed Mark Twain's reference to a frontispiece. 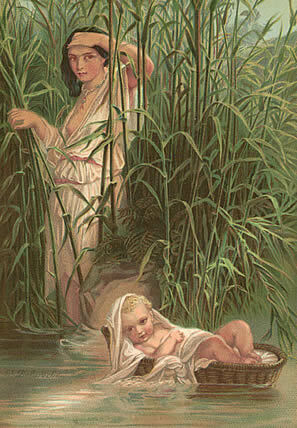 However, according to Mark Twain scholar Beverly David, the "Moses" frontispiece served another function. The picture combining a fine-arts master and a comic-book paste up made a thematic statement in pictorial form about the contents of the book. First a reader sees the picture, then on the first page of the book he learns that Twain's purpose in making the journey to Europe was to study art. The "Moses" engraving sets the tone for the rest of the book, warning us that this will not be a scholarly treatise on the fine arts. If the reader "reads" the engraving correctly his reaction will be to smile at Twain's idea of "art." Twain's admonition to his readers is not to be too gullible and his warning against believing everything you see or read continues from this frontispiece to the final chapter. (David, p. 155-156.). When Frank Bliss removed the "Moses" frontispiece to the last chapter of the uniform edition in Volume 4, this introductory aspect of the book was lost. No evidence has been found which indicates Clemens authorized the switch. 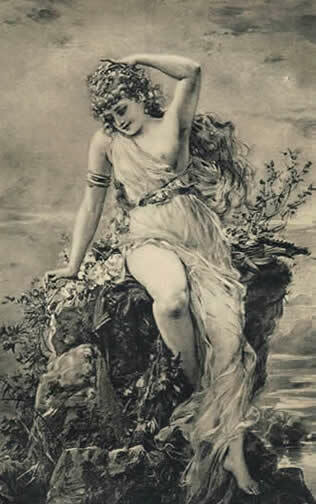 Chapter 16 of the first edition of A Tramp Abroad is titled "The Ancient Legend of the Rhine" about the Lorelei, a water nymph who sat on a rock and lured boatmen to destruction. For this chapter Mark Twain devised an illustration of an unattractive figure surrounded by human skulls. Whether or not the troll-like figure is exhibiting a sign of profanity with her hand is debatable. It was an illustration that supported his cynicism surrounding the legend and was a cue to his readers that he was, in reality, ridiculing the legend. For the 1899 uniform edition Frank Bliss substituted a painting of an extremely attractive siren. The original source of the painting of the beautiful Lorelei is uncredited and remains unidentified. However, much of Mark Twain's humor and intent is lost on readers of the 1899 uniform edition who see only the beautiful waiter nymph..
Lorelei from the 1880 first edition of A Tramp Abroad. The artist is uncredited. Lorelei from the 1899 uniform edition. The original artist and source of this illustration remains unidentified. Most of these illustrations which are wildly amateurish are part of the text which ridicules fine art. 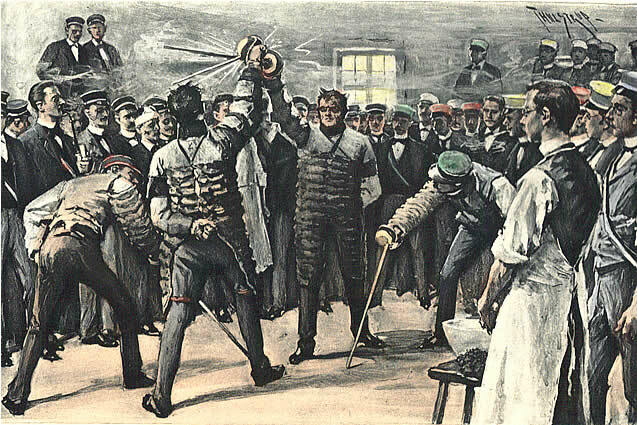 The overall effect of revising A Tramp Abroad for the 1899 uniform edition was that it lost much of the humor and satire which was dependent on the visual effects of the original illustrations. Collected sets that followed in the wake of the 1899 uniform edition either dropped A Tramp Abroad or continued to print it using a few of Thure de Thulstrup's illustrations. It would be almost a century before a new edition of this work would become available to scholars in 1996 when Oxford University Press reprinted a facsimile of the first edition, complete with original illustrations. Of all of Mark Twain's works that were revamped for the uniform edition, A Tramp Abroad is perhaps the one to suffer the greatest loss in the transition. David, Beverly. Mark Twain and His Illustrators, Volume II (1875-1883). (Whitston Publishing Company, 2001). Hill, Hamlin, ed. Mark Twain's Letters To His Publishers. (University of California Press, 1967). "Noted Artist Found In Home For Aged," The New York Times, 25 February 1928, p. 21. Thulstrup, Artist, Dies in 83d Year," The New York Times, 10 June 1930, p. 23. Thulstrup, Thure M. to Frank Bliss, 1899 April 17. Accession No. 6314, Box 4. (University of Virginia Library, Special Collections). Twain, Mark. A Tramp Abroad. (American Publishing Company, 1880). _____. A Tramp Abroad, Volumes I and II. Edition De Luxe. (American Publishing Company, 1899).